“I believe OC can be one of the most leveraged mission agencies with the greatest impact through the smallest footprint (in terms) of personnel,” says Murray Moerman, 24-year Outreach Canada/One Challenge Global Alliance worker and current OC Board member. Murray is the founding facilitator of the Global Church Planting Network (GCPN), an international group of evangelical leaders who together “track” God at work globally and connect people and resources to accelerate church planting among all the people, languages, nations, cities, and villages of the world. One Challenge does not consider its big impact a bragging point, but rather evidence of God’s great grace and his appointment of the OC Global Alliance (OCGA) for his purposes. That is a key point. What God is doing is being accomplished through the whole OC Global Alliance, 13 Mobilization Centers (sending bases) and 70-plus ministry teams. The numbers for 2018 have just been analyzed, revealing a very fruitful year with record setting numbers for personnel, decisions for Christ, new Churches established and other ministries. Here are some of the highlights. As you read this report, rejoice with us in what God did last year. Join us in praying for an even more fruitful 2019! For a quick overview of 2018, see our newly published 2018 Annual Report. In 2018, the most workers to date were active in the harvest field through the OC Global Alliance: 1,101. “Workers” means ministry members, ministry associates, ministry assistants and support staff. For every year since 2009 the number of Non-U.S. sent workers has been greater than the number of U.S. sent workers. Last year 55% of OCGA workers were non-U.S. Mobilization Center (US-MC) personnel. Nevertheless, in the last three years the number of workers associated with the US-MC has steadily increased after a long plateau, with greater involvement of Ministry Associates and Assistants. Another encouraging point is the all-time high numbers for short-term ministry workers. 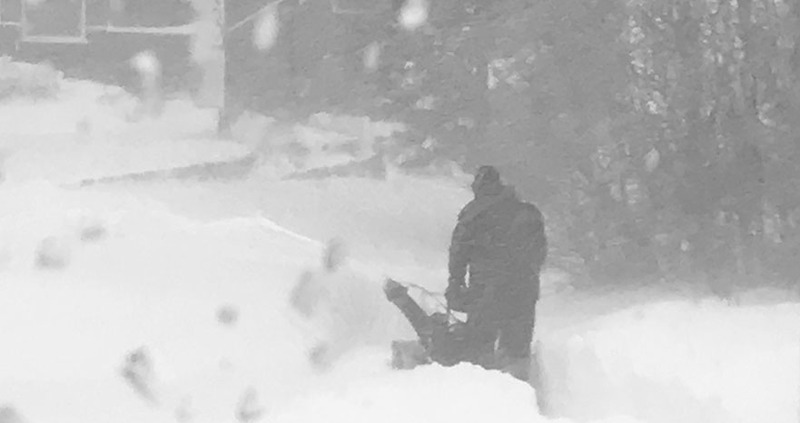 OCGA workers hosted 125 short-term teams, representing 1,194 people participating on short-term teams. 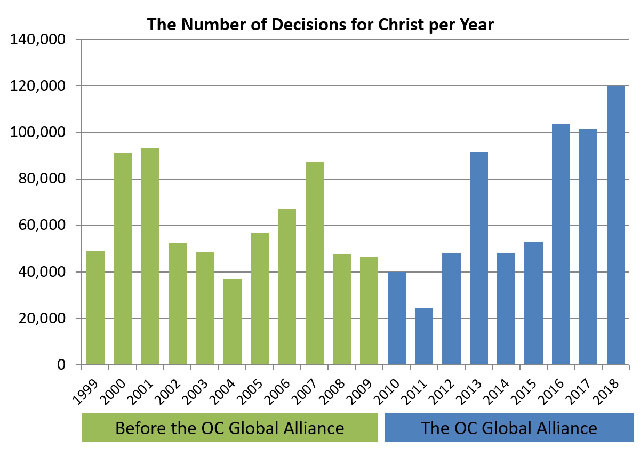 In 2018, workers in the OC Global Alliance saw the Lord draw the largest number of people to himself in the last 20 years with nearly 120,000 decisions for Christ. This represents 328 individuals per day choosing to follow or 2,300 per week. This is also the third year in a row with more than 100,000 decisions for Christ. Praise: Thank you, Lord, for adding men, women, and children daily to your glorious kingdom. In 2018 OCGA workers saw the most churches established in a single year: 15,055, 4,500 more than in 2017. This breaks down to 41 new churches per day or 290 per week. Significantly over two-thirds of these new churches are being established in Muslim majority nations. The accompanying graph shows the exponential growth in the number of churches established over the last eight years. What has made the difference? Disciple Making Movements. 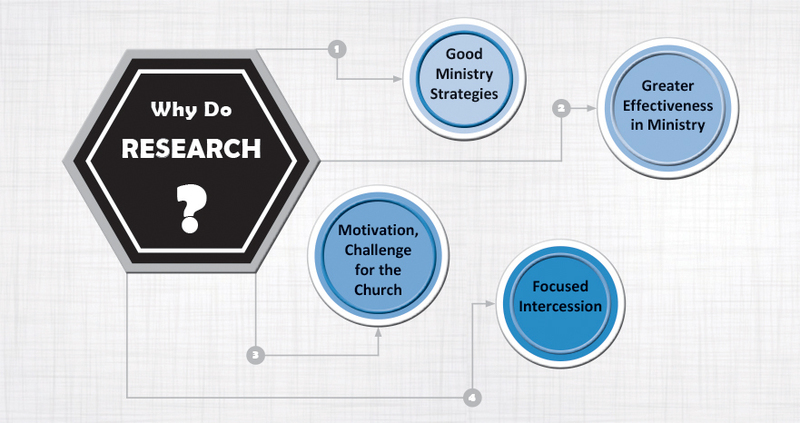 Read What are Disciple Making Movements? Praise: Thank you, Lord, that by your grace OCGA workers are making disciples and gathering them into newly established churches. God opened many doors for ministry in 2018. OCGA workers were resident in 42 countries and had impact ministries in 61 additional countries. This is the fifth consecutive year that more than 100 countries have been served by OCGA workers. OCGA workers also assisted 4,579 churches, encouraging them to set goals or take specific steps toward improved health or numerical growth. OCGA personnel served 3,530 students in 13 missionary children’s schools as teachers, staff, dorm parents, administrators or board members. OCGA teams collaborated with 572 organizations and networks, assisting the body of Christ. Praise: Thank you, Lord, for bringing the many parts of your body together to bring your transforming love and hope to people in over 100 different countries. 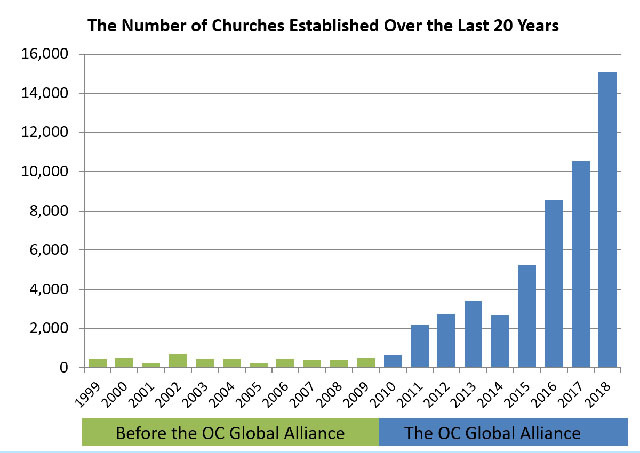 OC Global Alliance workers were engaged in effective, wide-range equipping ministry in 2018. Over 76,000 church leaders were better equipped for ministry by participating in congresses, conferences, seminars, consultations, or workshops in which OCGA personnel were involved in the planning, execution, or presentation. OCGA workers pursued more in-depth, longer term mentoring relationships with 9,281 Christian leaders. This is the second highest number of leaders mentored since 2000. In addition, OCGA personnel trained 4,589 students in theological schools. 2.6 million people around the world were better informed and equipped by media ministry through 89 ministry websites, 59 paper-and-ink publications and 298 digital publications. OCGA workers produced the most new ministry tools to date: 739. These include print or digital tools such as books, articles, reports, brochures, training courses, videos or other digital media. Praise: Thank you, Lord, for the millions impacted through these equipping ministries. Participation Challenge: Ask God how he wants you to contribute to equipping ministries, whether locally, or internationally, whether in person or through supporting others financially. Reflecting on the ministry fruit of 2018, we have many reasons to be thankful, especially the most decisions for Christ and the most new churches established thus far. We also saw the most personnel associated with the OC Global Alliance and the highest number of short-term teams and participants. The Lord has provided numerous opportunities for ministry, and overall, our equipping ministry touches more people now than before the Global Alliance began. All these are “signs” of the Lord’s hand upon us. May He continue to do far more than we can hope for or imagine in the coming years (Ephesians 3:20-21).